As a 501 (c)(3) non-profit, our programs are dependent upon your generosity. 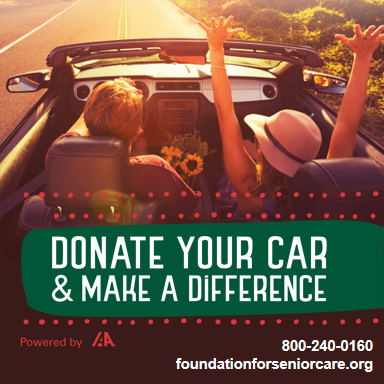 Donate to the Foundation for Senior Care today. Please note our founding name of the Fallbrook Healthcare Foundation will be displayed. YOU CAN MAKE A DIFFERENCE IN THE LIFE OF A SENIOR NEAR YOU! The Foundation for Senior Care is committed to serving the senior population. We are the recognized leader in providing programs and resources for seniors enabling them to enhance their well-being and give them a more meaningful life! Become a sustaining member by making a monthly contribution and provide ongoing support to the programs of the Foundation for Senior Care. The Foundation for Senior Care has the honor of providing resources and programs to assist seniors and their loved ones coping with the unique challenges that aging presents. You can help relieve some of the stresses and strains by supporting the Giving Heart Sustaining Member Program. $10 a month provides 24 rides to the doctor. $25 a month provides activities and respite to clients in the Day Care program. For each $1 given, we spend $.83 on programs and awareness. Yes, I have a Giving Heart! Your Giving Heart sustaining membership donation is a great way to ensure that the Foundation for Senior Care can provide transportation, advocacy and day care programs to seniors in our community. The Care Van program is a by-donation service providing door to door transportation for seniors and the disabled to medical appointments, physical therapy, pharmacies, grocery stores and more. The Care Vans run Monday through Friday from 9 a.m. to 4 p.m. Reservations must be made 48 hours in advance; medical appointments take priority. The Expanded Rides Program is offered by the Foundation for Senior Care. Volunteer drivers will use their own vehicles to transport clients to and from out of town medical appointments, originating in Fallbrook. All of the volunteer drivers are screened and background checked. The Foundation for Senior Care is staging a “Walks of Honor” brick campaign to help raise funds to build a memorial garden on our campus. We have a dream to enhance the grounds with lovely paths, park benches and tables, providing a place of serenity where one could go to sip tea and visit with a friend. We call it our Gardens of Hope. We are seeking support for both the capital investment for the Gardens and the long term maintenance. Our ‘Walks of Honor’ within the Gardens provide a way for each brick to lovingly say “Thank You” forever. As a permanent memorial, the named bricks will embrace the tradition of giving for all. The brick campaign offers two different sizes: the individual brick is 4″x8″ for a donation of $250; the family or corporate brick is 8″x8″ for a donation of $500. On each brick donors can leave a message such as In Loving Memory or In Honor Of. Or you could purchase a brick in honor of a person for a great birthday or holiday gift such as Mother’s Day, Father’s Day or Grandparent’s Day. It is a nice unique gift to leave your family legacy or honor someone specifically. Once we have a minimum commitment of 200 bricks, we will have a brick laying ceremony and you will see the placement of your brick. Brick donors will be kept informed of our progress. We ask that you help us get the word out to your family, friends, neighbors and co-workers. This is a unique opportunity to leave a permanent legacy. Are you an Amazon shopper? Amazon Smile donates portions of sales to your charity of choice! Use this link through Amazon Smile to shop all your Amazon needs and they’ll to Foundation for Senior Care (Fallbrook Healthcare Foundation). Be sure to register for us, because every little bit helps! The Foundation for Senior Care is building an endowment fund that will support our current programs and facilities, and provide for the future needs in our communities. Members of our planned giving program are donors who support our work, both today and in the future through your annual sustaining gifts, bequests, and other giving vehicles. There are various ways to make a gift. Some gifts may provide additional income to you or your family. All gifts give you the maximum tax benefits based on your individual situation. Whether it is an outright gift today or an estate gift tomorrow we hope you will consider becoming a member of our planned giving program. For more information about the planned giving, please contact Rachel Mason, Executive Director at 760.723.7570 or via email at mason@foundationforseniorcare.org. WE KNOW YOU HAVE LOTS OF OPTIONS WHEN MAKING A CHARITABLE DONATION AND WE ARE GRATEFUL FOR YOUR SUPPORT. The Foundation for Senior Care supports the Donor Bill of Rights, as adopted by many charitable groups, which states that philanthropy is based on voluntary action for the common good. To have access to the organization’s most recent financial statements. To be assured their gifts will be used for the purposes for which they were given. To receive appropriate acknowledgment and recognition. To be assured that information about their donations is handled with respect and with confidentiality to the extent provided by law. We are proud to be early adopters of GuideStar’s Platinum level, which indicates our desire to be transparent and clearly communicate how we serve as stewards of the funds entrusted to our organization. “The Club” is looking for new or gently used chair pads for our clients. Remove and rebuild bank of windows in computer learning lab – DONE, thank you Milgard Windows of Temecula. Fix or replace (6) bamboo/wood blinds.